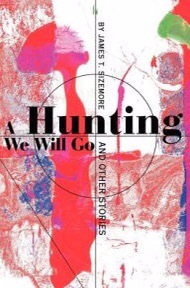 Recently I did something long overdue: I read my Uncle Jim’s self published book of short stories, A Hunting We Will Go. First let me say that his name was James Tennyson Sizemore. With a middle name like that, he was as destined to write as I am to dream. Though I would love to discuss his book with him, I’m also glad I waited. It was like having a visit with him, hearing him use his favorite pet names “Pal” and “Buddy” as I read them in his collection. How many times did he say to me “Sit down, Pal, and tell me what you know. It won’t take you but a minute.” He said that to everyone. It wasn’t an insult — it was an honest invitation to sit and chat, one I took him up on EVERY TIME. I adored the man. I was born on 700 hill (the number of a coalmine), near Omar, West Virginia. I quit school in the tenth grade, joined the army, and passed the GED test there. I earned a master’s in philosophy, but had a stroke before I could apply myself in my field. I’ve had six strokes, a heart attack, and near heart failure. I will be sixty-four my birthday, have been married for 43 years, and have three grown daughters. He must have written that in 2003, because we lost him in 2007, and when I say lost, I mean it in the sense that bright corner of my life went suddenly dark. Where do I start to talk about his work? I’m too close to the situation to even begin to hope I could be a good judge of the literary merits of the book, but I enjoyed it immensely. Every story yielded clues: what I already knew of his life combined with what I gleaned from his fiction. He described a sweaty West Virginia view of Morning Glories and I knew just where his character was sitting. I felt the mosquitoes because I’ve been there. I learned things, too. Like that The Appalachians are called “The Appies.” Who knew? Every story reminded me of what a good man he was. When his characters misbehave it’s so mild, so self consciously, that you know the author is deeply moral. There are stories that sound autobiographical, even though I know how erroneous it can be to assume that. When a character gives up his dream of teaching at the college level to become a metal spinner to support his family, it’s hard not to recall that Uncle Jim did just that. I cried when I read the story where a character loses his job due to his escalating illness because I suspect it’s true. Even though I know I wouldn’t really ask him such personal questions, I wish I could. I guess I feel as if I can assume that what he wrote tells me the emotional truth of his life. It’s important to me to believe that I truly “got” him. I think I did. Do. Notice: Self indulgent uncle heroism ahead. When I was a kid, Uncle Jim and his family would swoop into the hollow where we lived in West Virginia every few years. Grandma (just down the road from my childhood home) would start stirring up her famous fudge while singing, whistling, and cleaning as only she could. Then the awaited carload of my beloved cousins, my Aunt Naomi, her mother, Aunt Pearl, and of course, Uncle Jim. No matter how tired the man was from driving all the way from Chicago, he always flung his wiry arms wide for me. I, the most backward child ever, ran into them. He wore cuffed jeans, cuffed armed t-shirts and thick, intellectual looking glasses. They seemed just right on him. His skin was faintly olive and he wore his hair slicked back. He was a good looking man with a professorial voice and a confident smile. When he was making a point he’d extend his palm and let out a staccato laugh. He’d take a huddle of kids hiking to his old WV haunts: up “Sizemore Holler” (which was a quarter of a mile above the mouth of Sizemore Hollow, where my family lived). He carried me on his shoulders, picking apples, handing one up to me. I would sit and listen to him talk to everyone, his brothers, everyone else in the family. I was content to just listen but inevitably he would ask me my thoughts and treat them with great respect. When my family visited his, he eagerly took us about Chicago. He bought me my first mint chocolate chip ice cream cone. The flavor remains one of my favorites. He took me on a carousel and bought me a paddle ball and a treasured box of crayons. He let me play outdoors until way too late, catching lightning bugs and singing with my cousins on the stoop. Knowing he was a writer, I shyly showed him bits of my writing over the years. He was always beyond encouraging. I only wish I could have told him that I now have an agent. I know how much it would have meant to him. While I was studying our family’s genealogy, at the end of one of our long phone calls Uncle Jim gently said, “Okay, enough with the genealogy. Back to writing.” And I listened. In his collection, he worries whether or not his work will be read after he is gone. He need not have wondered. First of all, there’s no doubt that his beloved daughters and grandchildren will never forget his stories.